Residents of North Andover, we are long-time dog owners and dog lovers, with degrees in physical therapy and animal massage. We share our home with three rescued dogs: Vahva, Bandit and Buddy. We started down this path when our German Shepherd mix Saba had a total hip replacement in 1998. Being a physical therapist, Luis envisioned exercise and hydrotherapy to help Saba with a speedy recovery-he was a happy dog! A few years later Saba developed Degenerative Myelopathy, a neurological disorder similar to multiple sclerosis. More water therapy helped Saba live his last years comfortably. It wasn't until Spring 2000 that the first course in canine physical therapy was offered by Northeast seminars in Boston. For the next three years he enrolled in the certification program for Canine Rehabilitation Practitioner given by the University of Tennessee and Northeast Seminars. The program culminated in June 2003 when his class was the first in the country to successfully complete the program. 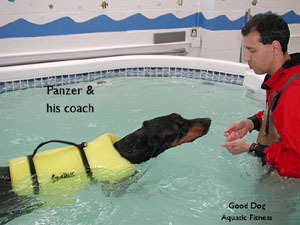 A year later, April 2004, we opened Good Dog Aquatic Fitness, a referral facility that specializes in canine hydrotherapy, rehabilitation, and massage therapy in North Andover, Massachusetts. Luis keeps up to date with new advances in canine rehabilitation by attending continuing education courses and the International Symposium on Rehabilitation and Physical Therapy in Veterinary Medicine. Luis Carrillo, PT, CCRP is a licensed Physical Therapist (New York University 1984, BS in Physical Therapy Sciences) and certified Canine Rehabilitation Practitioner (University of Tennessee, 2003), has over 21 years experience treating human patients, including a special interest in hydrotherapy. Luis is also certified by the American Red Cross in Pet First Aid. Mary Carrillo is a Certified Small Animal Massage Therapist from the Bancroft School of Massage Therapy for Small Animals in Worcester, Massachusetts (April 2005). She uses various treatments to help dogs toward a healthy recovery. She is also a certified Animal Care Specialist (North Shore Community College, Danvers, Massachusetts 2004) and has Pet Massage Institute Certification (June 2003) and a BS from Skidmore College 1983. Good Dog Aquatic Fitness, LLC are members of the American Canine Sports Medicine Association and the International Association of Veterinary Rehabilitation & Physical Therapy (IAVRPT).